The 2018 World Cup starts on June 14, and one of the greatest shames of the tournament is that Christian Pulisic will not be competing in Russia. Already the best American men’s player at the age of 19, Pulisic—an attacking midfielder for Germany’s Borussia Dortmund—was the lone bright spot of the U.S.’s failed World Cup qualifying campaign, which left the Americans out of the world’s most popular sporting event for the first time since 1986. Pulisic’s talent is incandescent. He can blow by world-class defenders on the dribble unlike any American before him. Had he competed in Russia this summer, Pulisic could have become a mainstream American sports superstar. Yet the summer of 2018 could still be momentous for Pulisic. Multiple English Premier League teams—led by Liverpool, but also including Manchester United and Arsenal—have shown interest in buying the young American from Dortmund for a transfer fee that could be worth around $80 million to $100 million, shattering the previous record for an American player. Pulisic’s potential is limitless, not just on the field but also off it, where the top clubs in Europe would love to use the preeminent American player to build their brand in the expanding U.S. soccer market. 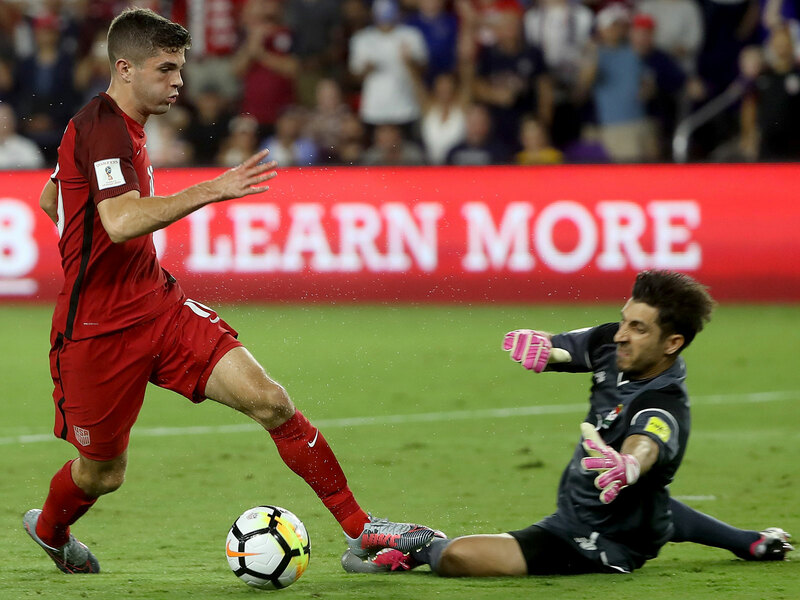 As SI’s Grant Wahl discovered writing his new book, Masters of Modern Soccer—an analysis of the craft of soccer, position by position, through seven accomplished and insightful figures from the European game—Pulisic is also wise beyond his years about how he views his role on the field. In this excerpt from the book, Pulisic explains in granular detail how he plays his position of attacking midfielder. The following is excerpted from Masters of Modern Soccer: How the World’s Best Play the Twenty-First-Century Game. Copyright © 2018 by Grant Wahl. Published by Crown Archetype, an imprint of Penguin Random House LLC. It’s an undeniable fact: The United States has never produced a global men’s soccer superstar. Have there been solid American players good enough to qualify for seven of the last eight World Cups? Sure. Mainstay goalkeepers who’ve enjoyed long careers in the English Premier League? No doubt. Even a rare top scorer for a midlevel European team? There’s always Clint Dempsey and his 22 goals for Fulham in 2011–12. But for all the growth of soccer in America over the last two decades—in the popularity of the men’s and women’s World Cups, in the rise of domestic leagues, in media coverage of the planet’s most pop­ular sport—we have yet to find a U.S. men’s version of The Cho­sen One. Which is to say, a true superstar, the best player on one of the top 10 clubs in the UEFA Champions League. The reasons for this failure are many, we’re told, and mostly related to culture. The majority of our best athletes go pro in other sports, from American football to basketball to baseball. Our most popular spectator sport, American football, is more about following orders than about the individual creativity we see in the best soccer players. Soccer is a pay-to-play, middle-to upper-middle-class pursuit in the United States, unlike in the rest of the world, where the working classes produce the best players with the drive to rise to the top of a Darwinian global pyramid. What’s more, when it comes to youth soccer develop­ment, most experts will tell you the U.S. doesn’t have nearly enough qualified coaches at the vital early ages—and that the coaches who are in place tend to value strength and athleticism over skills. But there’s another factor, too. The U.S. has produced teenage soccer players with the potential to be world class, but the all too common result has been prospects who thought they had “made it” by simply signing a healthy contract or joining a European club. Coddled by youth coaches and handlers, pumped up by the leagues, and showered with premature accolades by media and sponsors searching for the elusive American Soccer Savior (always that word, savior), these putative Chosen Ones decided they had climbed Mount Everest when all they had done was reach base camp. No example of the phenomenon is more sober­ing than that of Freddy Adu, who joined D.C. United at age 14 as the highest-paid player in Major League Soccer in 2004 and headlined a national television advertising campaign that year with Pelé. Though Adu showed flashes of talent for U.S. youth national teams, he never earned the trust of a coach at club level, where he played for 14 teams in 15 years, and was last seen riding the bench in the U.S. second division, a cautionary tale of blind­ing promise unfulfilled. All of which brings us to a low-slung, redbrick residential building in a quiet neighborhood on the east side of Dortmund, a former steel-and-coal city in western Germany’s Ruhr Valley. The two-story structure, fronted by evergreens and a small lawn, is the home of an American teenage soccer star, but it’s conspicu­ous not for what it is, but rather for what it isn’t. The place looks entirely ordinary from the outside. The windows—two rectan­gular slits on each floor—are usually covered by metal shades that give the building the appearance of a military bunker. The dead-end street is, well, pretty dead. There are industrial ware­houses, a modest health club, the administrative office for a gro­cery store. All things considered, the tableau could just as well be a bland suburb of Pittsburgh. And that’s the whole point if you’re Christian Pulisic, the 19-year-old Hershey, Pennsylvania, native who has emerged as one of the world’s most promising attacking midfielders for Borussia Dortmund and the best prospect in the history of U.S. men’s soccer. When Pulisic signed a new four-year contract in early 2017 and his father, Mark, moved back to the United States after two years in Germany, Christian could have decided he had arrived and splurged on his first adult apartment in the gor­geous new glass-and-steel buildings on Dortmund’s Lake Phoe­nix, a bustling hub of bars, restaurants and nightlife. Instead, he chose a street with no bars and no restaurants—and, truth be told, barely any neighbors at all—that’s a five-minute drive from Dortmund’s training facility. How do some of the game's smartest figures master the craft of soccer? By profiling players in every key position and management, Wahl reveals how elite players and coaches strategize on and off the field and execute in high pressure game situations. That’s not to say Pulisic’s apartment is shabby inside. In fact, it’s the dream dorm suite of any college freshman—which is ex­actly what Pulisic would be in the spring of 2018—if that fresh­man had ample amounts of discretionary income and a cleaning lady who came every week. “There’s a lot of space, but nobody had lived in this building for three years,” says Pulisic, welcom­ing me inside and giving me the grand tour two days before a game against Bayern Munich. Pulisic is renting, not buying, but he got permission from the owner to spruce up an indoor swimming pool on the ground floor with colorful tile work on the wall and a poolside hangout area. Upstairs, the main living room has enough space to toss 20-yard passes with an American football and features a pool table, a folded-up ping-pong table, and a big-screen TV for watching soccer, NFL, and NBA games. The walls are filled mostly with blown-up photographs of Dort­mund’s Signal Iduna Park, Germany’s largest stadium, where more than 81,000 adoring fans cheer on their team in a roiling sea of black and yellow. Pulisic has thick eyebrows, a ready smile, and, now that he has graduated from adolescence into adulthood, a chiseled chin and cheekbones; if there’s ever a movie made about his life, he might be played by the actor Jake Gyllenhaal. In Germany, ev­eryone pronounces Pulisic’s last name POOL-uh-sitch, the way it would be in Croatia, the birthplace of his grandfather Mate. That lineage allowed Christian to acquire a Croatian passport and start playing for Dortmund at age 16, earlier than he would have been able to with his U.S. citizenship alone. When he’s in the United States, Pulisic asks people to pronounce his name the Americanized way: puh-LISS-ick. The last four years of Pulisic’s life are a study in constant transformation. He moved first from his home in Pennsylvania to the U.S. Under-17 national team residency program in Bra­denton, Florida; then to Dortmund to live with his father; and then into his own adult apartment. He graduated from Dort­mund’s Under-17 team to its Under-19 team to its first team. He grew, physically and emotionally, from a child to a man. If you Google “2013 Nike Friendlies” and watch the highlights of Pulisic’s U.S. Under-17 team beating Brazil 4–1—the day he real­ized he could compete against anyone in the world—you’ll see a talented but still callow 15-year-old boy. The first touch is the foundation of an attacking midfielder’s relationship with the ball. You have to learn how to control the ball with your feet, as if they were hands, supple and cushioning, welcoming passes of varying weights without a second thought and setting up your next action. The task of a first touch be­comes harder when you’re under the pressure of an advancing defender. One easy way to tell the difference in the levels of pro­fessional players—and teams and leagues, for that matter—is in the quality of their first touches. If the ball clangs off players’ feet and legs with any regularity, you’re probably not watching a Champions League knockout game. The knock on American players is that their first touch isn’t, shall we say, cultured. During the 2016 Copa América Centena­rio, one snarky fan went so far as to post a YouTube compila­tion video—set to European trance music, like so many soccer highlight videos—of the U.S. forward Gyasi Zardes butchering first touches and losing possession of the ball. To his credit, Zardes has enough speed, determination, and finishing ability to at least partially make up for his control flaws, especially as an MLS player, but, at his age (26) as a professional, it’s impos­sible to perfect a first touch. Like so many other technical skills, it is best learned between the ages of 3 and 9, not 10 or 20 years later. Pulisic, for his part, began working on his first touch at an early age with his father, Mark, who was a professional soccer player and is now a coach. It starts when I’m 5 years old,” Christian says, “and my dad’s punting the ball in the air and I’m just bringing it down and working on my first touch with both feet.” Mark emphasizes that he wanted sports—including sports other than soccer—to be fun for Christian at that age, but that didn’t prevent the youngster from learning the fundamentals. First-touch work continues for Borussia Dortmund’s youth and senior teams in regular practice sessions and on the Foot­bonaut, a $3.5 million machine pioneered by the club that has its own building at the team’s training ground. (Mark Pulisic oversaw the Footbonaut during his two years as a Dortmund youth team coach.) The Footbonaut takes Teutonic efficiency to its fußball extremes. Built as an apartment-sized, cube-shaped cage, the machine fires balls from a range of 360 degrees at dif­ferent speeds and trajectories toward the player, who then has to control the ball with his first touch, raise his head to spot the destination (an electronically lit-up square on the perimeter), and pass the ball into the target. Coaches dial up the speed and reps and keep score of the participants’ success rate. Sometimes they add a defender to mark the player in the center circle. So much of modern soccer is about utilizing space and pres­sure. Pulisic has learned that he can’t take an attacking first touch all the time. If he’s in a central position deeper on the field, he says, he’ll sometimes be more conservative and hold the ball, not least because losing it in your own end can quickly lead to a goal by the other team. But if he’s higher up the field, his attack-first mentality is fully engaged, whether Dortmund has advanced the ball from its own half or has won the ball in the opposing end using its notorious defensive pressure. Dort­mund’s pressing requires every player, including forwards and attacking midfielders like Pulisic, to work together in unison. If one player slacks off, the pressure fizzles. The commitment is exhausting and requires peak fitness and concentration, but the rewards can be enormous. In transitions, the team that has just lost the ball is often unbalanced and exposed. It’s up to Pulisic and his teammates to take advantage of the opening as soon as possible. “When my team wins the ball or when I win the ball, your first look always goes forward,” Pulisic says. “That’s something our coach here in Dortmund [Thomas Tuchel at the time] stresses a lot. You don’t know: Someone could be peeling off and making a run forward, and you can slip a ball in. Anytime you can get to the goal as quick as you can, it catches the other team off guard, especially when they’ve just lost the ball.” On the other hand, when Dort­mund loses the ball, Pulisic has to make a decision in defen­sive transition. If he’s close to the ball, he says, he’ll put pressure on the ball carrier. If he’s farther away, he’ll retreat to defend a space. That’s modern soccer: Even as an attacking midfielder, Pulisic will always have defensive responsibilities. His attention to defense has helped earn him minutes on the field. Watch our weekly Planet Fútbol show on SI TV! Grant Wahl and Luis Miguel Echegaray bring their analysis on all of the biggest stories around the world along with interviews of high-profile figures from around the globe. Sign up for a FREE SI TV trial here. One aspect of Pulisic’s game in which he has nearly reached full maturity is beating defenders one-on-one with the ball. Wit­nessing him perform the soccer equivalent of “breaking ankles” on a basketball court and whoosh past seasoned European pros with a combination of speed, guile, and raw explosive power is a rush of pure adrenaline for anyone who’s watching in the sta­dium or on TV. You’re left with a slack-jawed sense of wonder: Did an American teenager just do that? In Pulisic’s confidence on the field and even in his appearance—maybe it’s that high-and-tight haircut—he’s a postmillennial version of Tom Cruise’s Maverick taking out the MiGs in Top Gun. You half-expect Pulisic to wear a bomber jacket, drive a motorcycle, and play beach volleyball bare-chested in jeans in his spare time. Yet Pulisic doesn’t want to be too predictable in one-on-one situations. Like a baseball pitcher, he’ll keep a defender guess­ing by mixing up his speeds. First, Pulisic might cut inside and turn on the jets. But when his opponent tries to catch up, Pulisic will stop in his tracks as his hapless foil overpursues and Pulisic moves in a different direction, the bamboozle complete. Unlike a baseball pitcher, Pulisic can also disguise his intent by being dangerous using both feet. He’s naturally right-footed, and he says he would shoot a free kick or a penalty with his right foot. If he has a lot of space and a simple shot that he needs to hit with power, he’ll probably go with his right peg. But he won’t change the direction of his movement to favor his right foot, he says. That’s why he has spent so much time improving his left foot since he started working on it with his father as a five-year-old. “Every day in training, even if it’s just a simple passing drill, I try to do as many with my left as I do with my right,” Pulisic says. We hear the word clinical so often in soccer discussions that it has become something of a cliché. But for Pulisic the term comes down to efficiency in the most important part of the field, the op­posing penalty box. The hardest thing to do in soccer is to score a goal, to have the judgment to know what to do in the box to produce results as consistently as possible. What’s the point of beating a defender one-on-one to burst into the box if you make the wrong decisions on passing or shooting once you get there? Learning to be clinical, Pulisic says, “is so many different things. It just comes down to your focus in the end, and how per­fect you want to make that pass or shot and just make it easier on your teammates and for yourself when you have to finish in the right times.” In his first full season in the Bundesliga, Pu­lisic studied the task of crossing the ball in the same way a high school senior (which is what he would have been in the United States at the time) might study calculus. Some of it was fairly basic: Once you beat a player, pull your head up to scan the land­scape for crossing targets. When it comes to clinical shooting, Pulisic explains, one of the best tips he ever received is something simple: Put the ball on target. If your shot has no chance to go in the goal, you can’t score. That said, you also have to be precise in your accuracy as a shooter, in much the same way that a baseball pitcher has to paint the corners of home plate for most of his strikes. The size of the goal—eight feet high by eight yards wide—has been the same since it was codified by the English Football Association in 1882. How much taller are goalkeepers today than they were in the 19th century? Well, one recent study revealed the average height of male army conscripts in the Netherlands—the home of 6-foot-5 goalkeeping great Edwin van der Sar—had grown by 8.3 inches from 1858 to 1997. The height increase of human beings over the last century was what led Major League Soccer to have serious talks about making the goals larger before the league started in 1996. On the previous day, Lionel Messi was at his imperious best in Barcelona’s 3–2 win at Real Madrid, dominating the world’s biggest rivalry game and scoring two goals, his second one com­ing as the match-winner in the 92nd minute to silence the Esta­dio Bernabéu. Pulisic watched every second. He has had a special connection to the city of Barcelona ever since his first trip there at age 7 with his family and three separate training stints at FC Barcelona’s famed La Masia academy, starting at the age of 10. While watching El Clásico—or any other game, for that matter—Pulisic doesn’t digest the scene the same way most viewers might. It’s all coming so fast these days. When a gifted teenager makes The Leap, rising from complementary player to star, im­provement can happen in a matter of weeks and months, not years. When Christian Pulisic played in the Copa América Cen­tenario in June 2016, he didn’t start any of the U.S.’s six games. By the time he joined the U.S. camp five months later in Co­lumbus, he was the best player on the team. Getting better feeds on itself. If you realize hard work can take you to a new level, chances are you’ll keep the habit and not feel satisfied until you reach that level. Pulisic’s production in the Bundesliga has already been re­markable. Yet if you ask Pulisic to be honest about the aspects of his game that need work, you had better be prepared to listen for a while. Pulisic has the chance to make it (eventually) because he knows he hasn’t made it yet.